Contributing Editor: R. Shane Tubbs, Ph.D. Many advances in medicine and surgery can be directly linked to improvements in understanding the structure and function of the human body. During the sixteenth century, the study of human anatomy became an objective discipline, based on direct observation and scientific principles. Not surprisingly, the study of human anatomy has progressed to its universal acceptance and recognition as a scientific discipline, essential for the practice of modern medicine. 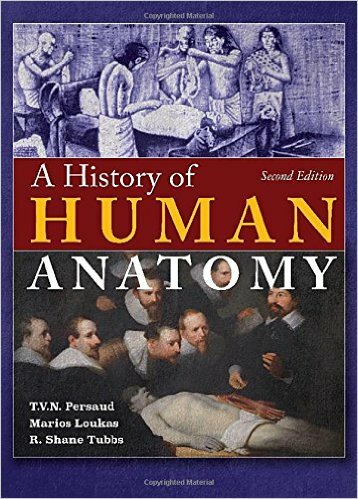 This revised and expanded edition presents anatomy from antiquity to the modern times. In this book, the authors present many scholars and teachers; the time periods, places, and impact of their work; controversies in anatomy; and advances in the discipline. These topics run the gamut from early pioneers in the art to the development of techniques that have propelled the study of anatomy to its current state. The authors have attempted to present the big picture regarding the historic anatomists and movements that have shaped our current understanding of what we now call medical anatomy. This beautifully illustrated edition spans nearly four centuries of medical history. It was a period of spectacular achievements during which many great medical personalities lived, made important anatomical discoveries, and produced impressive treatises. With the sheer volume of historical anatomy literature available, the authors followed a somewhat eclectic and selective course in presenting the most significant material in this work. As even now man continues to learn about the structure of his body with new and noninvasive technologies such as MRI, uncovering parts of the human anatomy never seen before, the study of the history of anatomy therefore continues alongside the study of anatomy as a scientific discipline without obvious end.